xkcd.com is an on-line comic (web comic) of romance, sarcasm, math, and language. Randall Munroe has been writing xkcd for at least five years. Maybe longer. ... just this guy, you know? I'm a CNU graduate with a degree in physics. Before starting xkcd, I worked on robots at NASA's Langley Research Center. What do the letters x-k-c-d stand for? This is tricky. Most of what they teach you in school is just as an example of how to think about algorithms; 99% of the time you shouldn't worry about optimizing your sorts. Just learn to implement Quicksort (which is very good) and use that without fretting about it too much. Note: If you're interviewing for a company for a position with a focus on algorithms, the above is not an excuse not to know your stuff. xkcd also offers an interesting little game. Geo-hashing involves meet-ups which accomplish the admirable goal of getting us away from our computers, getting out doors, exploring the great wide open. That is not the stated objective of the game, merely my editorial commentary. It resembles geo-caching but is a bit more complex, at least up front. Overcoming the initial hurdle is a completely sedentary activity. It only requires careful study of the instructions. I confess that I haven't tried it, but it seemed at least as pleasant as geo-caching. 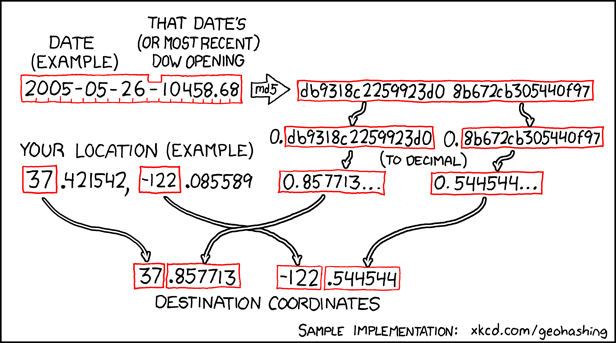 The xckd wiki provides complete details, including detailed accounts of many years of past geo-hashing events. I noticed that these geo-hashing excursions were held, literally, all over the world. The Algorithm captures the basics. I confess that I understood it very briefly, then not at all. But the wiki is extensive, and explains the rules quite clearly. Randall Munroe is actually quite a talented illustrator. I scattered a selection of his geo-hashing illustrations throughout. *All of Mr. Munroe's work is reproduced here under terms of Creative Commons License 2.0, see icon above.